The market for mobile applications, or apps, will become "as big as the internet", peaking at 10 million apps in 2020, a leading online store says. However, GetJar say, the developer community will decline drastically as each developer makes less money. 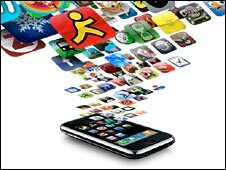 According to the Symbian Foundation, newly in the developer market, apps will become more personal and practical as their numbers grow. The comments were made at the MobileBeat conference in San Francisco. "Apps will be as big if not bigger than the internet," according to Ilja Laurs, chief executive of GetJar, a leading independent application store. "They will peak at around 100,000 by the end of the year. That will be a tipping point and after that there will be a gradual fall in the rate of development. "The full blossom will come in ten years and mobile apps will become as popular as websites are today with consumers," Mr Laurs told BBC News. While developers rush headlong to create applications for this burgeoning marketplace, Mr Laurs warned that many are simply doomed to fail. "The reality is that this space is only so big and only able to support so many people. Unfortunately the overhype that goes with [Apple's] App Store is what has driven so many to rush to develop for the market. It is fashionable to do apps and every media outlet tells you apps are cool. "But the economics are a different story. The ratio of those developers who will fail is about 90%; they will simply not make a return on their investment or make a good enough living at this," said Mr Laurs. He said that will result in developers taking their talent elsewhere and also slow down the rate of growth in applications. GetJar acts as an application intermediary, distributing apps and helping its community of 350,000 developers make money from their work. To date, Apple runs the most popular application store with over 65,000 applications. Last week it notched up another milestone with 1.5 billion downloads. Its success was a shock both to Apple and the industry. However, every smartphone company is trying to replicate it, from BlackBerry makers Research in Motion to the world's biggest mobile phone business, Nokia. Many at the MobileBeat conference in San Francisco felt that the popularity of Apple's App store is also its Achilles heel because it caters to the "one hit wonder" model. 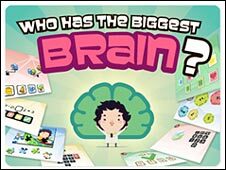 It is something social gaming company Playfish is well aware of with its iPhone app, "Who Has the Biggest Brain?". "It has been played on the web by 15 million people and when it launched on the iPhone it went to the top of the iTunes chart. But it quickly fell away and I think that's an experience many people are going through, no matter the quality or originality of the content," Playfish co-founder Sebastien de Halleux told the BBC. "You are competing for the top slot in a catalogue and you cannot, no matter who you are, hold onto that slot for an indefinite period of time. Many developers are realising that its hard to reach a sustainable business in a catalogue environment because it's a hit-driven environment." Mr de Halleux said heated conversations are going on within the industry to solve this problem. He also said he believed Apple wanted to find a way to help developers make money making apps that consumers want to use and pay for. 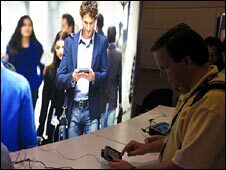 Meanwhile Lee Williams, executive director of the Symbian Foundation, said he was not sure the consumer or the industry needed any more application stores. "The App Store is flawed - right now [it] is just a bucket of apps. You need to get beyond that bucket and give the consumer the opportunity to wander down a really relevant aisle of content and applications that they can get access to. "When this problem is solved, the type of application you will see will be about more than an iBeer drinking app or a candle that flickers in different colours. "The type of application you will see will help enrich your life in some way. It will let you do your image sharing, your social networking and establish presence with your friends, colleagues and family in completely new ways - which is really what mobile applications are all about," said Mr Williams. At MobileBeat, organised by the blog VentureBeat, the issue of application stores seemed to dominate with conversations and panels on marketing techniques, turning apps into a real business and looking beyond apps. But Google's engineering vice president Vic Gundotra told the conference that the application store trend is just a fad and that the focus will shift to powerful browsers as the main mechanism for delivering services. "Many, many applications can be delivered through the browser and what that does for our costs is stunning. "We believe the web has won and over the next several years, the browser, for economic reasons almost, will become the platform that matters and certainly that's where Google is investing," Mr Gundotra told the conference. But referring to technical problems at the conference, MobileBeat organiser Matt Marshall told BBC News that scenario could be some time away. "You saw at this conference that the web went down once or twice and that shows you that even the main web has problems so what about mobile? "When you talk about mobile browsers, that is the biggest change in the last year. You have networks like AT&T, Sprint and Verizon all building out to the fourth generation and that's going to allow much more power in delivering those web browsers pages on your mobile phone. But it's not here yet," said Mr Marshall.